A ground-warbler from the Philippines is the 23 species of bird described in 2013. The species, named Robsonius thompsoni, is described in the August issue of the journal The Condor. 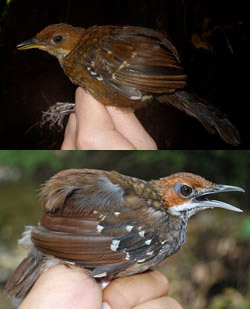 It was found after researchers from the University of Kansas, the Universidad Nacional Autónoma de Mexico, the University of the Philippines Los Baños, and the Philippine National Museum distinguished it from two similar ground warblers. The first evidence was the bird’s coloration, according to University of Kansas biologist Pete Hosner. The new species is named after Max Thompson, a retired professor from Southwestern College and a research associate in theBiodiversity Institute at the University of Kansas (KU). 3 of the “new” species were also described by researchers at the University of Kansas’ Biodiversity Institute. In total so far there are around 10,000 different bird species known to science. A ground-warbler from the Philippines is the twenty-third species of bird described in 2013.The species, dubbed Robsonius thompsoni, is described in the August issue of the journal The Condor. It was discovered after researchers from the University of Kansas, the Universidad Nacional Autónoma de Mexico, the University of the Philippines Los Baños, and the Philippine National Museum distinguished it from two closely-related ground-warblers. The first clue was the bird’s coloration, according to University of Kansas biologist Pete Hosner. Sierra Madre Ground-Warbler, Robsonius thompsoni, adult. Image credit: J.-C. Gonzales. The new species is named after Max Thompson, a retired professor from Southwestern College and a research associate in the Biodiversity Institute at the University of Kansas (KU). The Sierra Madre Ground-Warbler is the twenty-third species of bird described for the first time in 2013. Three of the “new” species were also described by researchers at the University of Kansas’ Biodiversity Institute. There are around 10,000 bird species known to science.